Get ready for election day parties. Countdown to election day and decorate with red, white and blue balloon bouquets held by our 3" Democratic Party Donkey symbol. 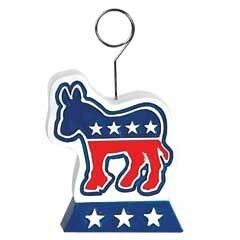 Our Democratic Donkey can be used as a place card or photo holder as well as a balloon weight. The Democratic Party Donkey is sold by the piece. Balloon weight is 6.6 oz's. Please order in increments of 1 piece.